Marketed as "making share dealing a doddle", Selftrade provides you with a simple and competitive pricing strategy, access to the FTSE100 and other financial products and financial information all on a very simple dealing platform. Sign up is straight forward with all the usual security procedures and a 3 day wait for your initial deposit to clear. Once you are set up you can begin trading immediately. This is not only a great way to save money but also a fantastic opportunity to test the water; buying and selling without throwing away money on commission fees. To help you get started you'll find useful a tutorial which takes you through the features offered by Selftrade. Once this is over it is incredibly easy to get started trading with confidence due to the stark simplicity of Selftrade. It is safe to say that it is the most basic of online share trading platforms, however this does make it at times feel rather rickety. For those of us even slightly computer literate, it wouldn´t have done any harm for Selftrade to add some functions to aid navigation and ease of use. The simple price plan of Selftrade is great for beginners as you know exactly what you are buying into and do not feel pressured into adjusting your trading behavior simply to benefit from cheaper rates and market information. 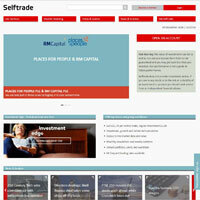 Selftrade charge £12.50 per transaction which is, although not the cheapest on the market, certainly competitive. Where Selftrade really shines is in its regular investor service which allows you to purchase shares on a set date for a transaction cost of just £1.50. Selftrade can offer such a cheap price by purchasing shares in bulk on behalf of all their customers on a selected day up to 7 days after your request. This does mean that prices may drop in these 7 days, hence you may have been able to buy your shares for less, but also prices may rise, resulting in savings for you. Despite sacrificing a small amount of flexibility, this is a great way for small traders to slowly build up medium to long term investments, as most potential profits you miss out on due to price changes will be easily offset by lower commissions. The regular investor service is also a great way of reducing risk as you can slowly build up your profile in reaction to market conditions. Furthermore, the low monthly transaction costs make it cheaper to diversify your profile. However, remember that the flat fee of £12.50 still applies to all sales and so more transactions will still mean higher costs. Basically, reducing the diversity of your portfolio is like putting all your eggs in one basket but it will also reduce your transaction costs, whilst a more diverse portfolio will require more transactions and hence higher costs yet will be more steady as risks are spread, reducing potential losses. Although at first glance the trading opportunities with Selftrade are rather limited, upon closer inspection you will find that most markets can be accessed, just in a less direct manner. For example, if you want to get involved in commodity trading you can invest in ETFs which are pooled funds based on various commodity prices. Likewise you could invest in companies involved in the supply side of a certain sector. For example, an investment in British Petroleum or suppliers of exploration equipment, oil rig servicing, etc., is a more indirect route to investing in oil which also carries fewer risks. The same can be said for world markets. To take another example, if you think that the NASDAQ will rise significantly, then investment in FTSE100 companies engaged in a high volume of trade with Japan would be your ideal investment choice. Selftrade also offer great deals on investment funds which are basically investment options with a specific focus, such as emerging markets, ethical investments, pharmaceuticals, etc. Selftrade offer 0% purchase commission on these funds (except for their £12.50 flat fee) and will even pass on to their customers any savings they can make through specific negotiations with fund managers. For most of us, these trading opportunities will be adequate, in fact, any more is likely to just confuse. More experienced traders looking to invest larger amounts, however, may well find Selftrade´s opportunities rather limited and inflexible. In the same way, market information provided by Selftrade is reasonable, but not enough for experienced traders and we would even recommend small investors look elsewhere to complement what's on offer here. Overall, Selftrade is incredibly simple, maybe even a little too simple. Although it avoids the daunting complexity of many other platforms in this category, we felt it fails to strike a middle ground and could have offered a little more. That said, the prices are competitive and the information is sufficient so they at least have the basics. Though it may not be as comprehensive a service as some other online stock reading sites we've reviewed, Selftrade represents a significant upgrade to telephone based stock trading.